In Yiddish, the word simcha is defined as joy or happiness, but it more commonly refers to a festive occasion, as a celebration marks life’s happiest special events. While I love to bake for my family and friends any day of the week, it is a true honor for me to contribute a baked good that will help commemorate a significant moment in their lives. So when my sister called and asked for a dessert to be served at her friend Lindsay’s baby shower, I jumped at the chance to help. I think I may have jumped too soon, though, as her next sentence included the phrase gluten-free. More specifically, gluten-free cupcakes- I’ve got another Yiddish phrase you may have heard that was befitting this situation- Oy Vey! Okay… a minor hiccup as I’ve never attempted any gluten-free baking before. But I was confident I could make it work. I’d simply do my research, as per usual, land on a reliable recipe, and do the best I could. Oh, wait, there was one other little detail I failed to consider… I was without a kitchen. We had just started a gut renovation, and I no longer had a sink, stove-top, oven, etc. to accommodate any baking at all. Luckily, what I did have is an extremely generous Aunt living nearby, who graciously opened her home and lent me her fabulous kitchen for this project. (Thank you so very much, Aunt Maggie!) With more solutions than problems on the horizon, I felt ready to tackle the challenge. After reading lots of reviews, I discovered a very informative book dedicated solely to gluten-free cupcakes with plenty of recipes to choose from: Artisanal Gluten-Free Cupcakes by Kelli and Peter Bronski. I settled on the classic chocolate cupcakes, which I figured I could dress up with a white chocolate mousse filling and fudge frosting like my traditional Triple Chocolate Cupcakes. Yet as bake day drew closer, my self-assurance waned, and I convinced myself I’d never pull it off successfully. Usually in this situation I would do a trial run beforehand, but I certainly wasn’t going to inconvenience my Aunt any further just for taste testing purposes and to put my mind at ease. Then, a light bulb moment- why futz with a slew of unfamiliar ingredients and drive myself crazy worrying about sub par cupcakes, when I could simply select a naturally gluten-free recipe more likely to produce delicious results? I was scared of disappointing my sister, but when I threw the idea of a flourless chocolate cake her way, she gave me the green light without hesitation, and thus I was off in an entirely different direction. This recipe from King Arthur sort of fell in my lap, and offered both ease of preparation and simplicity of ingredients. The best part? It didn’t require xantham gum. Dense and extremely rich, flourless chocolate cakes (or tortes) pack a punch of chocolate flavor in every bite and have a soft, almost mousse-like texture. Most contain ingredients found in every baker’s pantry: unsalted butter for richness, eggs for lift (as there is no other leavening), chocolate and sugar. My recipe also included cocoa powder; depending on the brand, cocoa is about 60% starch, which provides body, structure, and chewiness that would otherwise be missing in the absence of flour. It also called for two chocolate flavor boosters, coffee (in the form of espresso powder) and vanilla (I used my latest obsession, vanilla bean paste). Instead of having to whip the egg whites and yolks separately, my recipe added them whole, eliminating extra steps. And even better, it offered an actual internal temperature to test the cake’s doneness. 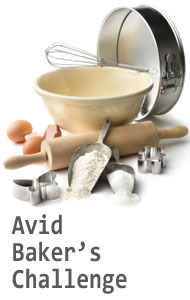 I must admit, I always hate that part- deciphering if something is done baking or needs another few minutes. I love when my instant read thermometer eliminates the guessing game. While I’m not sure why the magical temperature was 200 degrees, I did learn that the proteins in the eggs coagulate at 165, creating added structure for the cake. After pulling the cake out and letting it cool, I was able to refrigerate it overnight before adding the finishing touches. 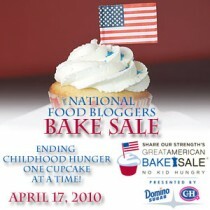 Another bonus- baking the day before the event was actually desirable as the texture became even more smooth and fudgy. The “icing on the cake” was the chocolate ganache poured over the entire torte, hiding any and all imperfections, and providing a final glossy coat of pure chocolatey goodness. 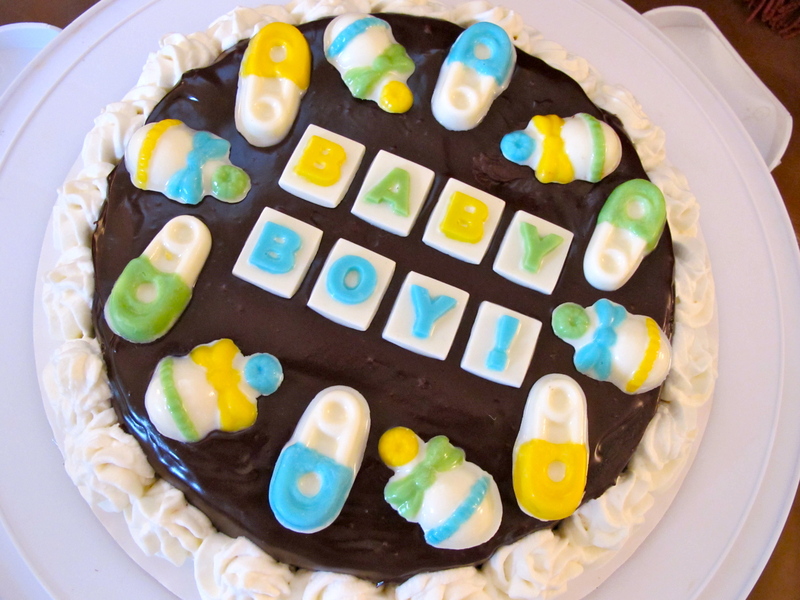 While still wet, I attached the baby themed, hand painted chocolate decorations I made in advance, and at the last minute, piped the lightly sweetened whipped cream rosettes. (I was worried that the whipped cream wouldn’t hold up through the trip, but my friend Steph offered highly useful advice to ensure it would; add some powdered sugar, which contains cornstarch, to stabilize the cream. Worked like a charm!) It was then ready to make its debut at the celebration. My sister returned home with glowing reviews to report, and I couldn’t be more pleased. Most importantly, the guest of honor was extremely moved by her friends’ thoughtfulness (I found out right before that the shower was a surprise), and I hope my cake made it all the more special. Congratulations Lindsay, and best of luck with the arrival of your new bundle of joy! 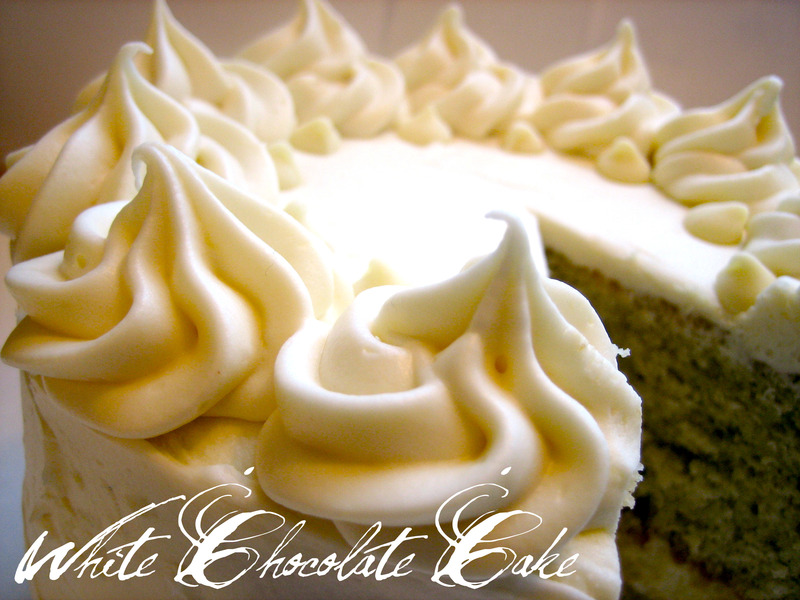 Note: Because there are so few ingredients in this cake, their quality is of the utmost importance. Obviously, the chocolate is the star here: I used a mixture of Guittard and Ghriadelli baking chips along with Valrhona cocoa (swoon), and even though I never tasted this beauty, I can honestly say the intoxicating aroma emanating from the oven while it was baking was the embodiment of pure, unadulterated chocolate. Everyone in the room had to restrain themselves from grabbing a fork and digging in, and my Mom was eagerly gathering the fallen crumbs. Preheat the oven to 375 degrees F. Lightly grease an 8″ round cake pan; cut a piece of parchment or waxed paper to fit, grease it, and lay it in the bottom of the pan. To make the cake: Put the chocolate and butter in a microwave-safe bowl, and heat until the butter is melted and the chips are soft. Stir until the chips melt, reheating briefly if necessary. You can also do this over a burner set at very low heat. Transfer the melted chocolate/butter to a mixing bowl. Stir in the sugar, salt, espresso powder, and vanilla. Espresso enhances chocolate’s flavor much as vanilla does; using 1 teaspoon will simply enhance the flavor, while 2 teaspoons will lend a hint of mocha to the cake. Add the eggs, beating briefly until smooth. Add the cocoa powder, and mix just to combine. (Next time, I’ll sift the cocoa powder into the mixture to avoid having lumps in the batter). Bake the cake for 25 minutes; the top will have formed a thin crust, and it should register at least 200 degrees F on an instant-read thermometer inserted into its center. (Start checking a few minutes early, mine was done at 23 minutes). Remove it from the oven, and cool it in the pan for 5 minutes. Loosen the edges of the pan with a table knife or nylon spreader, and turn it out onto a serving plate. The top will now be on the bottom; that’s fine. Also, the edges will crumble a bit, which is also fine. 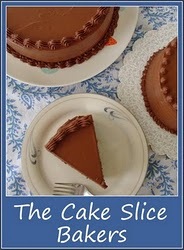 Allow the cake to cool completely before glazing. To make the glaze: Combine the chocolate and cream in a microwave-safe bowl, and heat until the cream is very hot, but not simmering. Remove from the microwave, and stir until the chocolate melts and the mixture is completely smooth. Note: I used a combination of 2/3 cup/4 ounces bittersweet and 1/3 cup/2 ounces semisweet chocolate in the cake and the opposite proportions in the glaze. 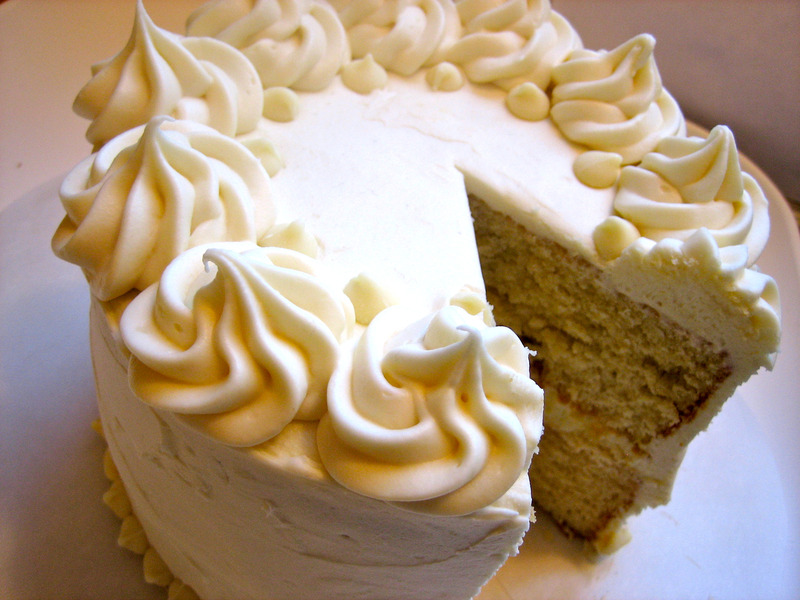 The Cake Slice Bakers: White Chocolate Cake + a bonus cupcake! When I woke up this morning, I peered out my window to discover a world swathed in a blanket of pristine, glistening, pure white snow. Few seasonal panoramas can compare to the beauty of fluffy flakes falling delicately upon unadorned tree branches and layers of freshly collected, bright winter ground cover. It seems only appropriate that the treat I bring you today is in keeping with mother nature’s color palette- a decadent, luscious yet light White Chocolate Layer Cake, this month’s assignment for The Cake Slice Bakers. 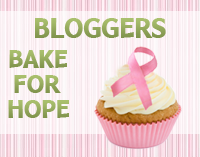 I’m so glad to be back in action, baking with my fellow blogging buddies, who I’ve missed dearly during my recent absence from Hot Oven, Warm Heart. I can’t wait to catch up and see how everyone dolled up their latest cake. For my own creative spin, I decided to utilize some leftover whipped white chocolate mousse as a filling, and according to my tasters, that element was the perfect addition to an already delicious confection. (You’ll find the recipe below.) Unique and refined with a subtle flavor profile, this elegant cake would be a lovely dessert to grace your holiday table. I guarantee it will disappear well before the snow! Made of cocoa butter, sugar, milk solids, vanilla, and lecithin, white chocolate is technically not considered chocolate at all, due to its lack of chocolate liquor. It first appeared in Switzerland in the 1930’s, invented by the Nestle Corporation as a way to use up excess cocoa butter, and was later popularized in America with the distribution of Nestle’s Alpine White Chocolate Bar. To select a good quality white chocolate, make sure it contains cocoa butter rather than the substandard brands made with hydrogenated vegetable fat. The inferior preparations might be less expensive, but they also lack the cocoa butter’s characteristic rich, creamy flavor. The tell tale difference between the two is in the color- true white chocolate has a deeper ivory hue, in contrast to the bright white shade of the imitation variety. When working with white chocolate, a good tip is to treat it with care and always melt it over low heat, which will help prevent the common problems of scorching and seizing. 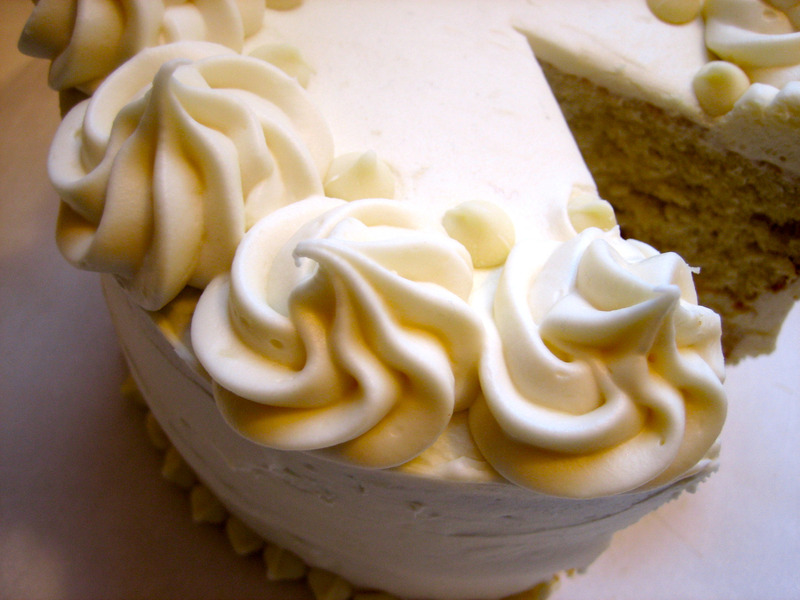 This month’s Cake Slice Baker’s selection features white chocolate in each of the cake’s components: a healthy dose in the batter, more mixed into the cream cheese frosting, and in my case, a little extra in the improvised mousse filling. Instead of baking in the recommended 9” pans, I decided it was the ideal opportunity to break out my adorable new 6” rounds and give a miniature sized version a go. Of course, I called upon my super knowledgeable friend Steph of the famed A Whisk and A Spoon, who has graciously acted as my personal source for any and all baking 911 needs, and she shared her always reliable tips and tricks. I learned that you can pretty much take any standard 9” cake recipe, and successfully cut it in half to produce an irresistible 6-incher, perfect for a small gathering or in my case, just two grateful tasters. Steph pointed out that the key with such recipe modifications is in the baking time. It can vary greatly from the larger version (she recommends checking about 10 minutes early) OR be nearly identical. That was the case with my mini white chocolate cakes, which were ready to come out of the oven at 27 minutes (right in line with the 25-30 minutes suggested in the recipe instructions.) To test for doneness- I recommend adhering to the instructions- the cakes are ready when golden brown, spring back when touched gently in the center, and are beginning to pull away from the sides of the pans. I guess I should have headed the warning mentioned in the book’s Baking 101 section that said checking a cake too soon with a toothpick can cause it to collapse. Whoops! That’ll teach me to be overzealous! But the slight imperfection of a thin concave marking was easily hidden with mousse and frosting, and the cake was none the worse for ware. As with every baking experience, I learned for next time. “Wow is all we can say about the wonderful chocolate cupcake filled with delicious white chocolate mousse! A work of art, but more than that, an explosion of flavors in our mouths. You are truely an artist. Would love to have Gourmet Magazine taste these. Hmmmmm yes indeed. If we still had our restaurant, you would be our baker. Thank you and keep baking, and of course we will be your tasters. Here are the recipes I used, which I highly recommend you try! 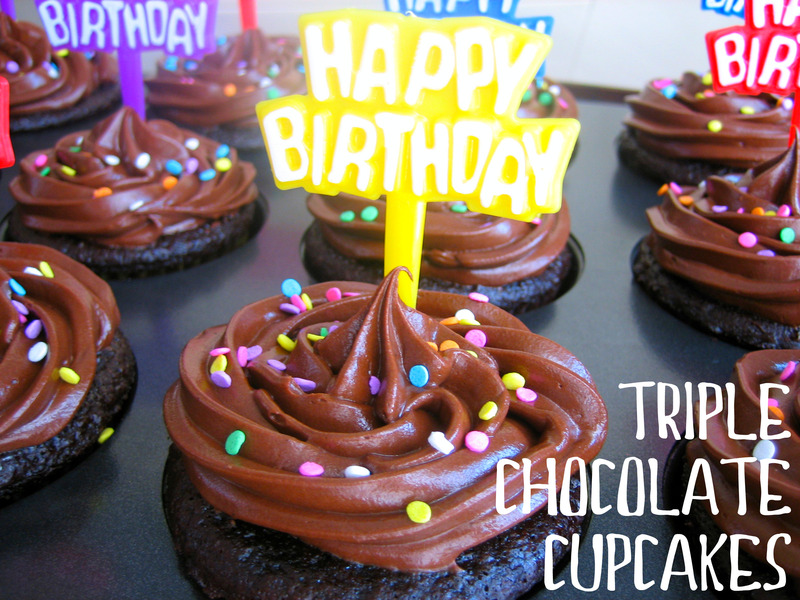 *This recipe makes exactly 2 dozen cupcakes- I’ve baked them this way twice, and both times they took 22 minutes (a toothpick should come out with no crumbs attached- don’t worry, they shouldn’t collapse!). It’s most definitely my go-to chocolate cake recipe, and has never let me down! Melt the white chocolate with ¼ cup cream in a double boiler. Whisk until smooth. Remove from the heat and let the white chocolate cream cool to room temperature. When it has cooled, beat the remaining ¾ cup cream until soft peaks form. In a clean bowl whip the egg white with the sugar until fairly stiff peaks form. Fold the beaten egg white into the white chocolate cream, then fold in the whipped cream until blended. Be sure not to over mix. *I only used half of this recipe to fill the cupcakes, but if you have any left over, don’t let it go to waste! Before I had my light bulb moment when I thought to put the rest in my White Chocolate Cake, I planned on making these Whoopie Pies– which will still be on my list! 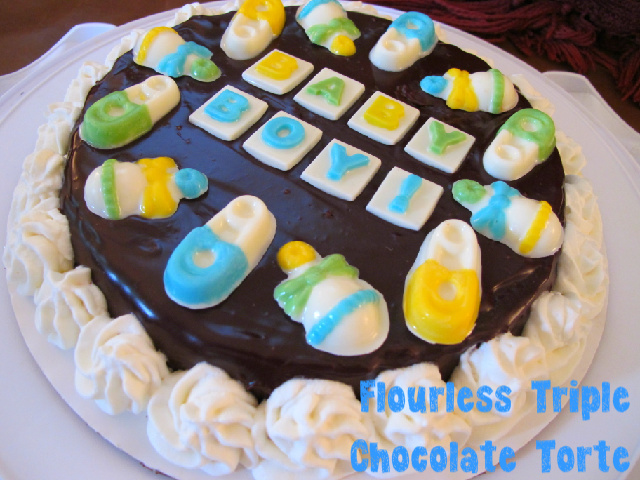 Note: This frosting may be made with milk, semisweet, or bittersweet chocolate. 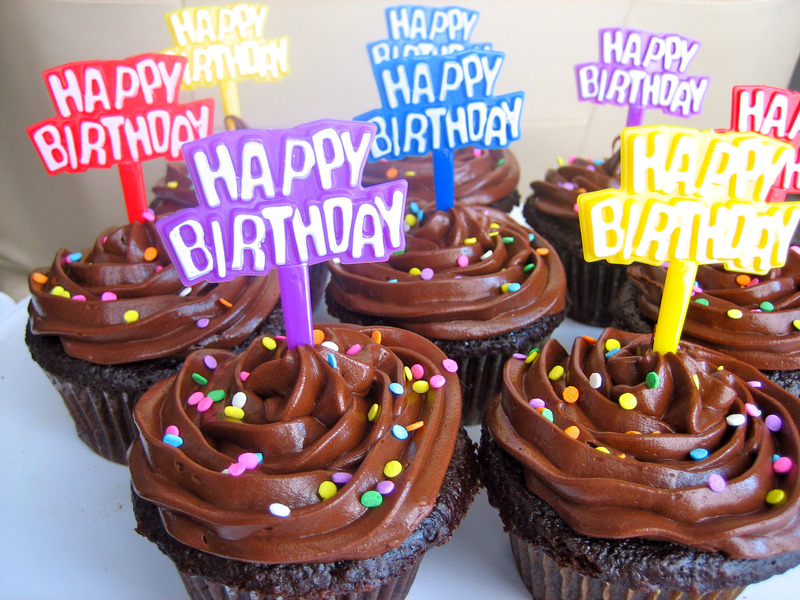 (*For these cupcakes, I prefer a frosting made with milk chocolate.) Cool the chocolate to between 85 and 100 degrees before adding it to the butter mixture. The frosting can be made 3 hours in advance. 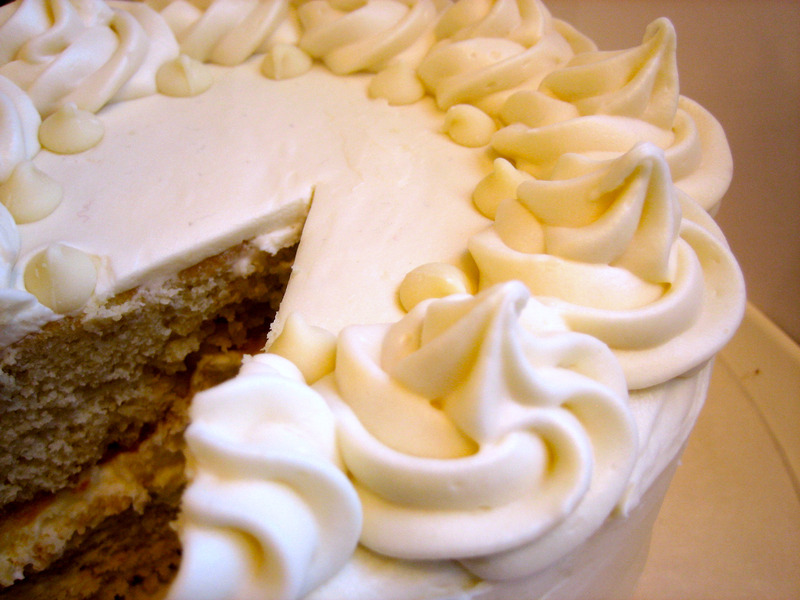 For longer storage, refrigerate the frosting, covered, and let it stand at room temperature for 1 hour before using. In food processor, process butter, sugar, cocoa, and salt until smooth, about 30 seconds, scraping sides of bowl as needed. Add corn syrup and vanilla and process until just combined, 5 to 10 seconds. Scrape sides of bowl, then add chocolate and pulse until smooth and creamy, 10 to 15 seconds. Frosting can be used immediately or held (see note). 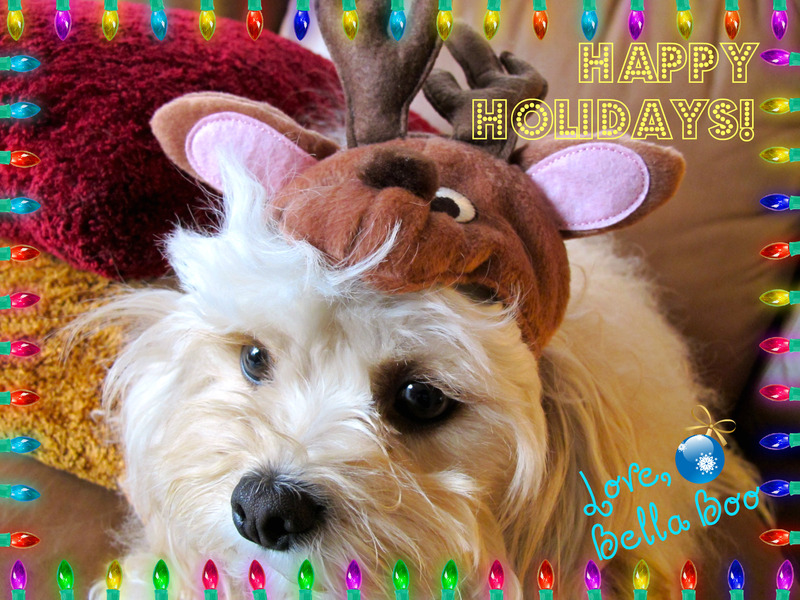 If those cupcakes don’t put a smile on your face, take a look at my baby in her holiday best! Much love to you all and warmest wishes for a glorious holiday season! As a special treat, my Mom used to take my big sister Jessica and I to our local bakery, where we were each allowed to make our own selection. While I always hemmed and hawed, usually allured and distracted by the cupcakes topped with a huge pile of frosting meant to resemble Sesame Street characters (to this day I’m baffled by their appeal), I ultimately chose one of two pastries: a half moon cookie (also known as a black-and-white cookie) or a classic whoopie pie. Both featured two contrasting elements, had a soft, tender texture, and were utterly delicious. I have fond memories of savoring every bite of my preferred snack, knowing that I had done something my Mom recognized and appreciated worthy of a sweet reward. To this day, whoopie pies bring back encouraging childhood memories, and yet this recipe marked their inaugural appearance in my kitchen. After completing Melissa Murphy’s Spiced Pumpkin Cookie Cakes, and receiving nothing but glowing reviews from both my family as well as the hospital nursing staff currently caring for Jess (I figured that sharing these pies with her medical providers would be a wonderful way to express my sincere gratitude for all their help), I knew it would not be their final showing in my home this season. A whoopie pie, also referred to as a gob, bob, or black-and-white is a type of cookie sandwich composed of two round, mound-shaped pieces of cake, usually chocolate or pumpkin flavored, that are filled with a sweet, creamy frosting. 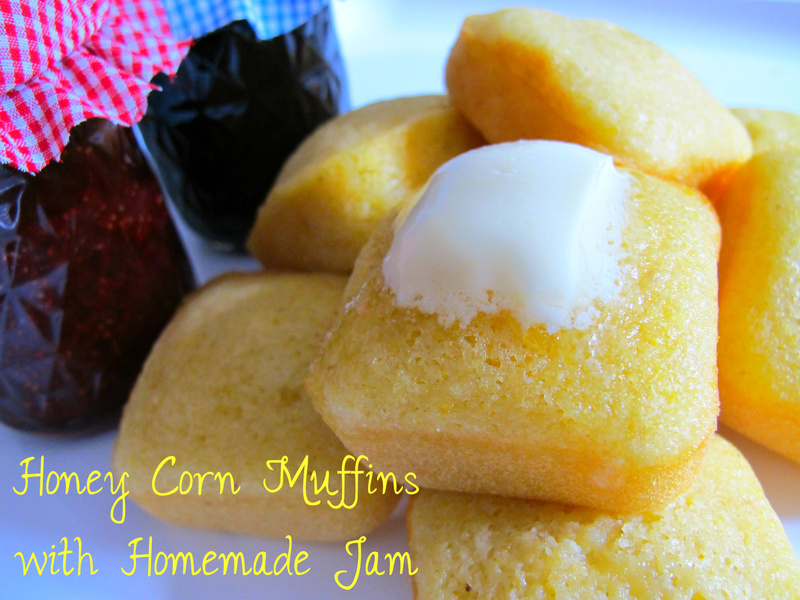 According to Pennsylvania Amish tradition, generations of Amish women would utilize leftover batter to prepare these baked treats, and pack them in their farmers’ lunchboxes. 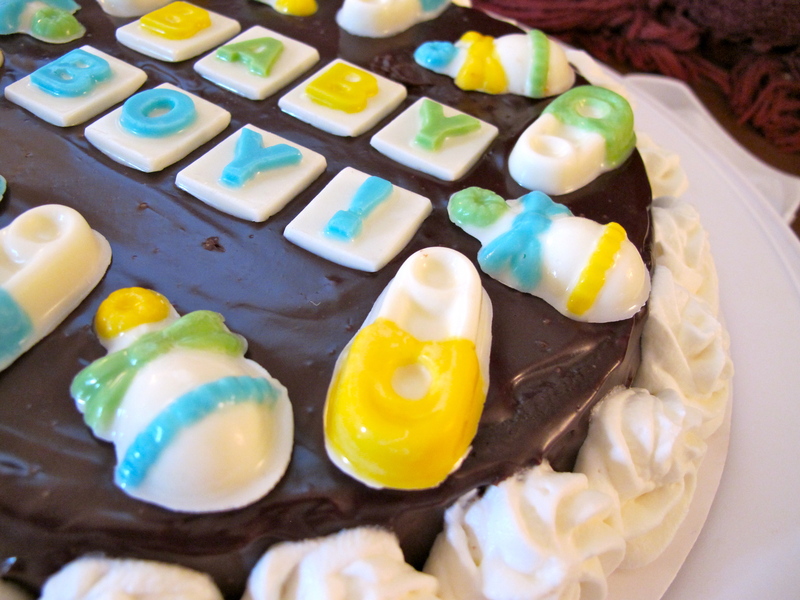 Legend says that upon discovering the cookie cakes in their lunches, farmers would shout with excitement, “Whoopie!”, giving the sweets their unique name. While most renowned in New England, and adopted as a state tradition in Maine, whoopie pies are gaining popularity across the United States. Melissa must have missed the memo about the animated farmers’ exclamation, because she titled her recipe “Cookie Cakes”- although it may be a more descriptive name, it’s nowhere near as entertaining to say. 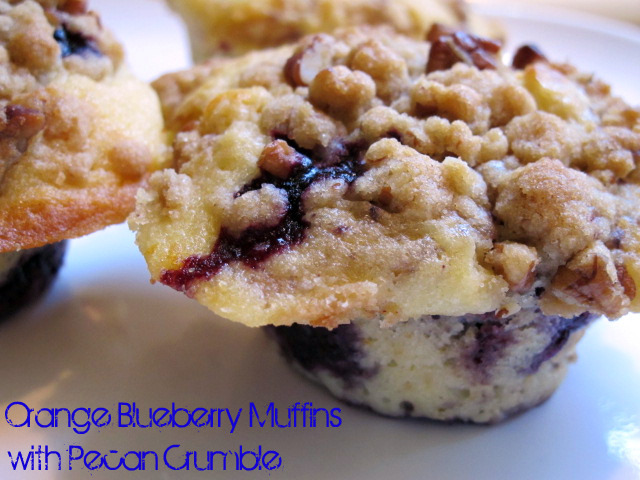 Regardless of designation, these delectable little morsels are the ideal antidote to blustery New England weather. Puffy pumpkin cakes accented by warming fall spices and thoughtfully paired with a citrus spiked cream cheese frosting make for an exceptional flavor combination which dances on the tongue. As a New England native, I’m accustomed to the colossal sized saucers sold in bakeries up here that are challenge for one taster to finish without sharing a bite or two. But Melissa’s cakes are of a daintier nature- I made mine a bit bigger than stated in the directions, and my cookies were still only 2½ to 3″ in diameter. The pumpkin imparted a deep burnt orange hue to the cake portion, which contrasted beautifully with the bright white creamy filling. 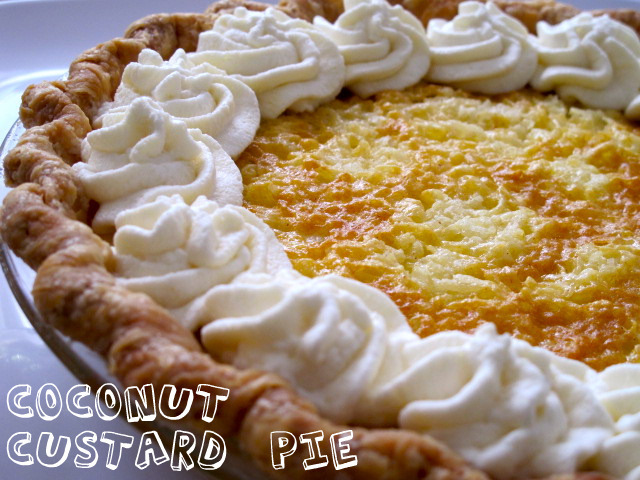 Speckled with finely grated orange zest, the cream cheese, butter, confectioner sugar frosting had that extra punch of bright flavor, a nice twist on the original straight-up vanilla cream. I’ve come to the conclusion that Melissa considers citrus zest one of her secret weapons in the kitchen- elevating the level of sophistication many of her baked goods embody and offering a surprise twist to the classics. In certain applications, I’ve felt it was misplaced and detracted from the overall appeal, however, I feel it gives just the right amount of pep these pies need. I’m even thinking about adding it to my favorite pumpkin loaf recipe- a killer quick bread I will definitely be sharing with you soon! 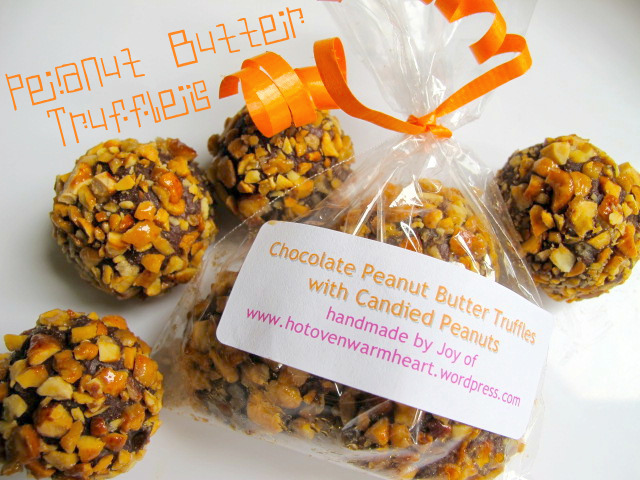 I highly recommend you hop over to the kitchen and bake a batch of your own, or bookmark this yummy recipe to serve at your next soiree this season- they’d be the perfect hand held single serve dessert for your Halloween party or even Thanksgiving. If you do whip up some of Melissa’s cookie cakes, I have a few recommendations to expedite the process. Melissa advocates using a pastry bag to pip the batter onto prepared cookie sheets- I found this step unnecessary, and really, if you can avoid the hassle of cleaning out a bag and tip, I say take advantage of the opportunity. I found that my handy dandy small-sized ice cream/cookie scoop worked perfectly, and bonus!- it ensured that all my cookies came out nice and round and exactly the same size, which made for even sandwiches. My scoop distributed about 1 tablespoon of batter per cookie (much more than Melissa’s suggested rounded teaspoon, which seemed kind of measly to me), but the baking time remained the same- mine passed the toothpick test in about 13 minutes. I also ditched the pastry bag for dispersing the frosting- my small offset spatula, which I can’t live without, by the way, worked just fine. I didn’t bother measuring out a specific amount of filling per pie, I simply spread on an even layer that was enough to support the top and leave space between the two halves. A little squish, and you’ll be in business. Sending out a big “WHOOPIE!” to Debbie for her fabulous SMS selection. 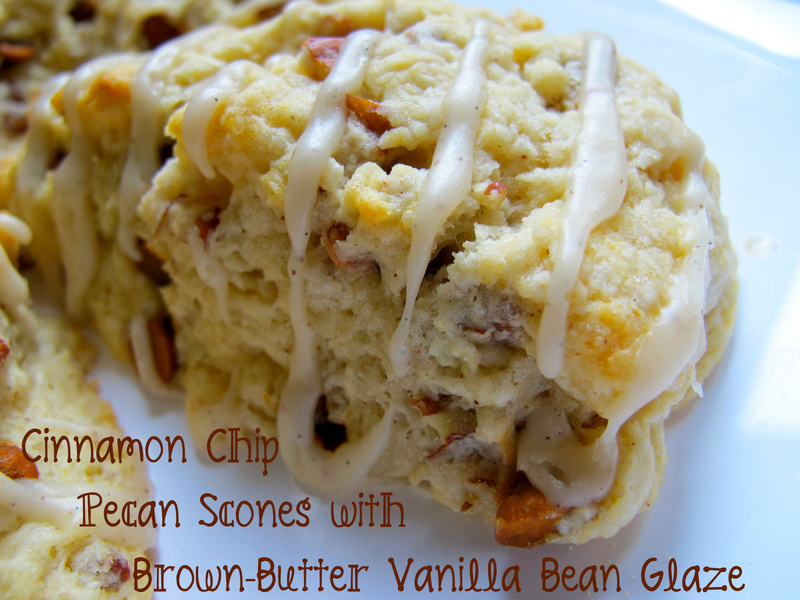 You’ll find the recipe over at Every Day Blessings of The Five Dee’s, in The Sweet Melissa Baking Book, as well as catalogued in my keeper files. 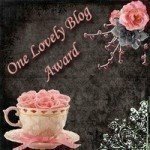 And don’t forget to take a peak at the plethora of pies produced by all the other ladies on our blogroll. Yesterday morning, this curious kitchen occurrence came true as I stared at this week’s SMS selection, the cover recipe of The Sweet Melissa Baking Book, Fallen Chocolate Soufflé Cake. Thankfully, this time my cake listened to my pleading, and sunk ever so slightly in the middle, creating cracks and crevices along the surface. Un-molding the cake only enhanced its homely appearance, revealing un-even sides that looked sadly smushed together. While it wouldn’t be winning any beauty contests, it did resemble the book’s photograph, and I was hoping that the cake’s flavor far exceeded its appearance in impressiveness and overall appeal. But before I could serve and find out, I had to wait patiently for the cake to cool completely, giving me the perfect opportunity to discover how this cake came to be. In the mid-1970s, famous restaurateur, Narsai David, set off an absolute sensation with his over-the-top dessert aptly titled the Chocolate Decadence Torte. Ever since, pastry chefs round the world have been crafting devastatingly rich chocolate desserts hoping to achieve ultimate chocolate nirvana on a plate. The intensely flavored French-style desserts unite the seemingly paradoxical qualities of a dense truffle and airy mousse. A palate and preference for these chocolate treats spread quickly throughout the American public, and variations like the ubiquitous flourless chocolate cake began popping up on high-end dessert menus everywhere. Another such adaptation is the fallen soufflé cake, a hybrid of sorts between a chocolate mousse/soufflé and a flourless cake. Fortunately for the baker, the nerve-wracking anxiety of soufflé baking is eliminated, as a fallen dessert is the desired result. While the batter is constructed and baked just like a soufflé, it is allowed to cool thoroughly, during which time it falls, compacting the texture. It’s best served slightly re-warmed, so the consistency remains more like a mousse than a dense fudge. Traditionally, fallen soufflé cakes are served accompanied by a custard, caramel sauce, ice cream, or sweetened whipped cream. I’m sad to say the Fallen Chocolate Soufflé Cake in The Sweet Melissa Baking Book didn’t quite live up to expectation. The reaction my tasters had at first bite can be described in one word: surprise. My dad remarked, “I taste something, but it’s not chocolate… it’s not orange, is it?” Apparently the single teaspoon of orange zest and splash of Grand Marnier was enough to overpower the central ingredient. Even with over 10 ounces of Ghirardelli, it just didn’t deliver that punch of chocolate flavor I was after. My mom chimed in commenting on the lack of sweetness, and asked if I had used all bittersweet chocolate. Nope. All semisweet here. Both had no problem polishing off their slices, and complimented the cake’s surprisingly light texture, but then came the kiss of death: “It’s just not my favorite,” my mom said gently. When my number one fan, who loves EVERYTHING I make, utters those five telling words, I know that there won’t be a second showing of the dessert in my home. I still have to thank Sarah of The Blue Ridge Baker for pushing me to try something I’ve never tackled before. I’m now inspired to find the fallen chocolate cake of my dreams, and don’t you worry, when I do, I’ll be sharing. Please still check out Sarah’s fantastic site, where you’ll find the recipe along with a bonus chocolate cake that she deemed “heavenly.” I’m certainly adding that one to my must-try list! And remember to check out how all the other lovely ladies’ cakes came out too! Citrus recipes and I go way back. The first thing I ever attempted to make solo was fresh lemonade for my Grandma and Papa. I was so proud of myself as I presented each of them with a full glass, and I watched eagerly with anticipation as they took their first sips. My grandmother smiled ear to ear and declared it the best she’d ever had, while my grandfather winced intensely, unable to hide his tastebud’s acute reaction. Apparently, I had forgotten a rather important ingredient (it’s hard to remember all TWO components of lemonade, you know)… the sugar! I didn’t have much more success a few years later when I tried making fresh squeezed orange juice on Mother’s Day, after presenting my mom with a beautiful antique-style juicer. After cutting, pressing, and praying over an entire bag of oranges, I emerged from the kitchen with a pathetic, measly 1/3 of a cup of juice to accompany her breakfast in bed. I later realized I had purchased the wrong kind of oranges, unsuitable for juicing- who knew such citrus fruit existed? Despite my early citrus centered failures, I’ve had much better luck utilizing these fruits in my baking. A few months back my Mom returned from California with a bag full of the most vibrant, juicy lemons picked from a tree at my great aunt and uncle’s home in Encino. I did some recipe searching, and settled on Ina Garten’s lemon cake, a moist, bright, lightly glazed loaf that my family raved about and quickly devoured. And thanks to Melissa of the delightful blog, Lulu the Baker, I’ve now found it’s orange counterpart, Whole Orange Poppyseed Cake. This exceptional cake employs a unique method of infusing citrus flavor. As the name implies, it’s not only the zest and juice of the fruit incorporated into the recipe, but literally the entire orange! It’s cut into segments and simply thrown into the food processor with some sugar, pulsed thoroughly, and broken down into the most aromatic orange-flecked mixture imaginable. With all the essential oils residing in the peel, every ounce of orange essence is incorporated into the batter, not just the flavor from a few teaspoons of zest. You would think that the white pith might add bitterness, but fortunately, this is far from the case. A lovely finishing touch of a citrus glaze adds a gorgeous sheen and sticky sweet-tart bite. I utilized the same technique I used with my lemon cake when applying the glaze- first, I poked the top all over with a toothpick, and then brushed on the glaze, allowing it to seep down into the cake, and enhancing the delicate crumb with tremendous moisture. The poppyseeds are an unexpected and fun mix-in, which pair just as well with orange as the more commonly matched lemon. And bonus! Oranges just so happen to be packed with health benefits, especially in the often discarded peel. A great source of Vitamin C, oranges also contain phytonutrients with healing properties- the most powerful of which, Herperidin, is found in the peel and inner white pulp, has strong anti-inflammatory properties, and can reduce blood pressure and cholesterol. Because it’s found in the peel and pulp, rather than the liquid orange center, you usually miss out on these powerful health benefits. Not so with Whole Orange Poppyseed Cake! Each bite packs a punch of flavor and nutrition. Incredibly fragrant, quick to pull together, and simple yet sophisticated, this cake is a lovely choice to serve guests and pairs well with coffee or tea. My dad’s review noted that it tastes as good as it looks and smells, a compliment I’ll take any day! A big thank you goes out to Melissa for selecting this fantastic SMS pick- definitely check out her adorable site, and give the recipe a try. 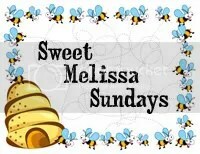 Also, take a look at what the other SMS bakers cooked up this week by exploring the Sweet Melissa Sunday’s blogroll. A beloved dessert with different variations all over the world, cheesecake is said to date back to 776 BC, when the Greeks served it to the athletes at the first Olympic games. The Romans soon caught on, spreading recipes throughout Europe, and eventually the confection made its way along with immigrants to America. In 1872, while trying to duplicate the popular Neufchatel cheese of France, American dairymen developed a formula for an un-ripened cheese they named cream cheese, which was even richer and creamier than the original. As the main ingredient of the modern cheesecake, this breakthrough ushered in a new age of cheesecake baking. Today, while there are many different styles reflective of various regions, most Americans can agree that cheesecake holds a special place in our country’s heart. *Use room temperature ingredients- It is much easier to whip softened cream cheese, and will help achieve the creamy and smooth consistency you want for your batter. *Don’t over-beat the batter- If too much air is incorporated into the filling, the cheesecake will puff when baked and sink as it cools, and is also likely to crack. It is actually the eggs that will hold air in the batter, so add them last, and then mix as little as possible, only until combined. *Bake the cheesecake gently using a water-bath- A long, slow bake allows for a more uniform internal temperature, and a water-bath, or bain-marie, keeps the oven moisture high and the heat gentle. Wrap the bottom of your springform pan in aluminum foil, place it in a larger pan, and pour hot water halfway up the outside of the springform pan- by using this technique, the cheesecake will cook more evenly. *Don’t over-bake!– An over-baked cheesecake tends to crack and be dry, not creamy. The cheesecake is done when the top jiggles as a whole and the center two inches look softer and slightly moist. Remember, the cheesecake will continue to bake after it is removed from the oven, and the texture will smooth out as it cools. *Loosen the cake from the edge of the pan after it comes out of the oven- Run the tip of a knife or narrow spatula between the top edge of the cake and the side of the pan, which allows it to pull away freely from the pan as it cools. 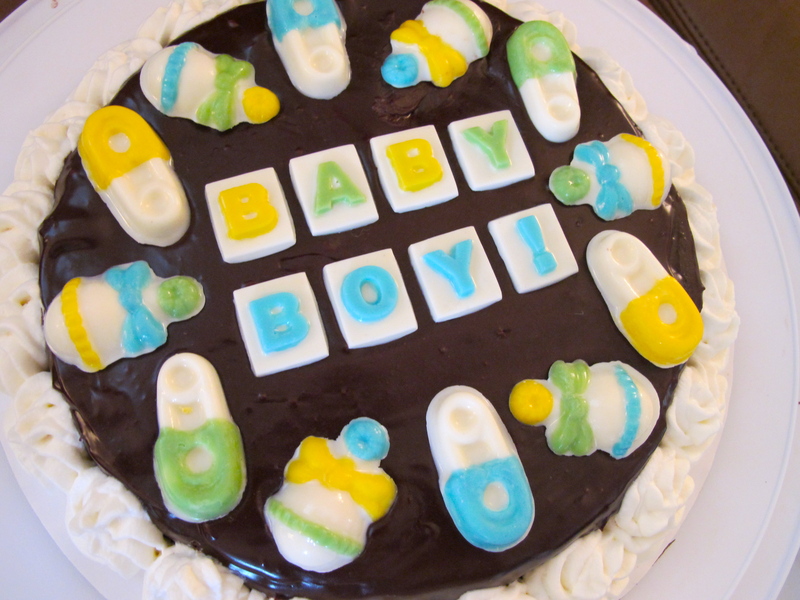 *And finally, chill, baby, chill- After the cake comes to room temperature, refrigerate at least 6 hours, but ideally, overnight. Chilling the cheesecake allows the cream cheese to sink into the crust and ensures the dessert is firm and easy to cut. It’s definitely worth the wait! Thank you to Eliana of A Chica Bakes for choosing this great cheesecake recipe, and pushing me to expand my ever-growing baking repertoire. And of course, a big thanks to Toby and Rebecca for taking care of my little girl.